Hello, friends! Mask Mania Anis is back. Today I am going to share about another mask range and this time it's from a K-beauty brand called Mamonde. 'Mamonde' is actually a French word meaning 'my world' and this brand takes inspiration from everything in nature, especially flowers 🌸🌹🌻🌷 I wrote about them coming to Malaysia last year so you can read more there if you want to find out more about the brand. 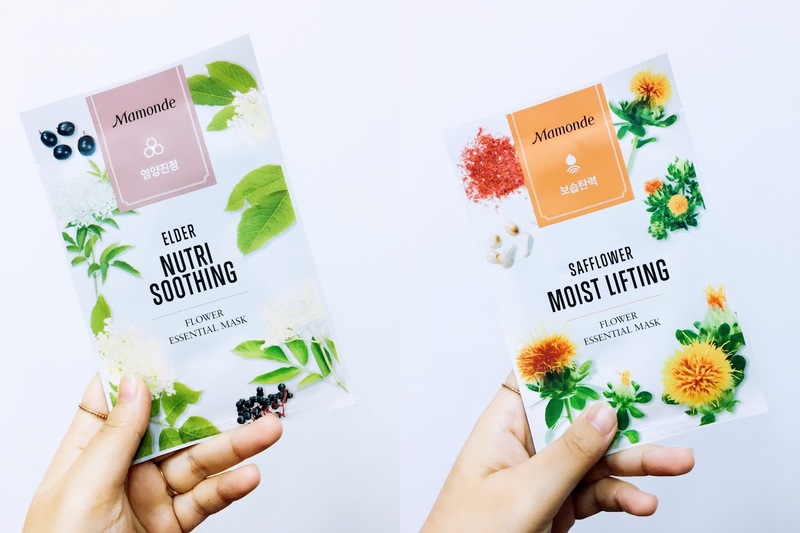 Anyway, I got these Flower Essential masks for quite awhile now but since it took me some time to try all ten varieties that I purchased, this review came out later than I initially expected. 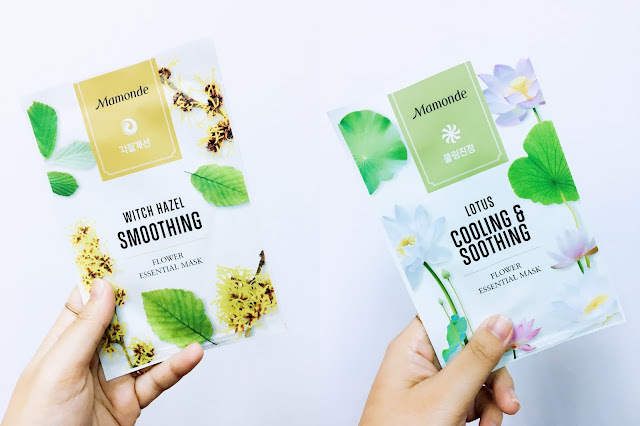 After checking www.mamonde.com website to look for some additional information, seems like they've changed the packaging of these masks range from flowery looking to a more plain design. I also noticed that types available are also slightly different from the old packaging. There are 16 varieties of masks under this range (with the flowery packaging) and the one I got are: Orange Blossom, Magnolia, Pomegranate, Lotus, Jasmine, Witch Hazel, Elder flower, Safflower, Sun Flower, and Camellia (10 pieces). The other six that I didn't managed to get are Sage, Lily, Evening Primrose, Peach Blossom, Rose and Echinacea. I have yet to try the new one so I might purchase them soon to compare if its just the packaging or they actually revamped the whole formulation. From what I see, some ingredients from old range are not available anymore in the new version but I wonder if they changed the mask sheet too. 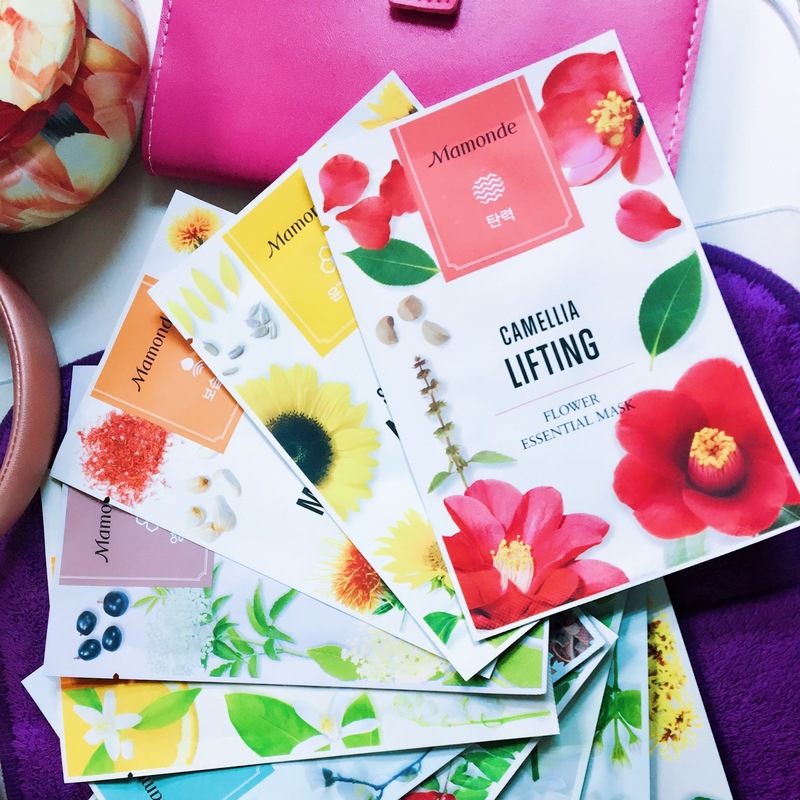 A functional wrinkle-correcting firming sheet mask with the powerful antioxidants of camellia flowers that bloom even in the severely cold winter with powerful vitality to relieve aging, while camellia leafs smooth rough, dull skin. My thoughts: I think this one has the strongest scent one out of these masks that I've tried. I only have Elder & Jasmine left to try at this point when I am writing my thoughts on this mask. The milky solution was also slightly stingy to my eyes as well and give me a sticky feeling after applying. Probably one of my least favourite out of the bunch. 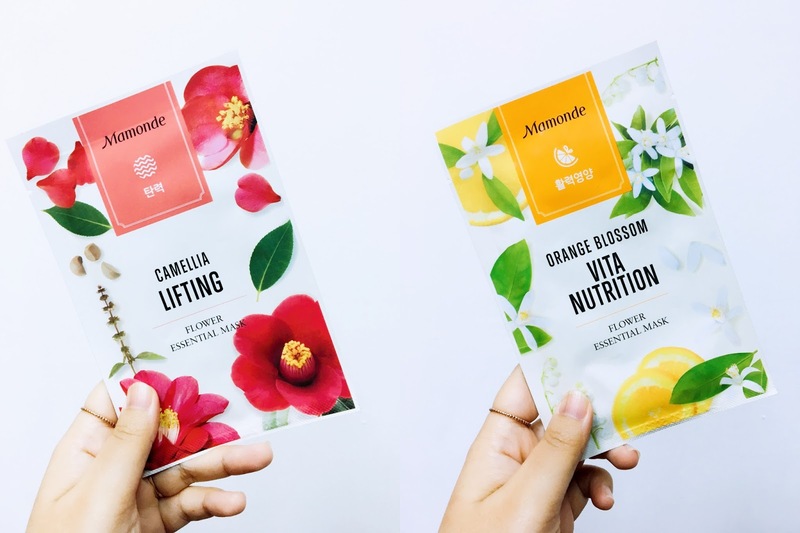 A vitamin-charging nourishing sheet mask that replenishes the skin with vitamins and moisture with the tangy orange flowers and fruits for healthy, clear skin. My thoughts: Smells almost like nothing with a slight hint of 'diluted' citrus scent like Vitamin C. Not sticky. My skin feels smooth afterwards and fairly hydrated. A nourishing and soothing sheet mask with the soothing effect of elderflowers to relieve concerns and nourishment of elderberries to leave your skin smooth and healthy. My thoughts: This mask have a pretty mild scent compared to a few others in this range. I also didn't experience much stickiness with this one. 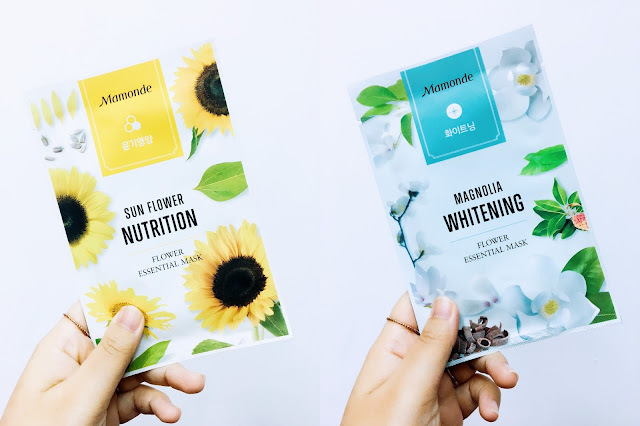 A hydrating and firming sheet mask with the antioxidants and growth energy of safflower and safflower seeds for nourishment and hydration to revitalize rough, sagging skin to restore oil-moisture balance and firm the texture. My thoughts: Smell refreshing, light essence and non-sticky to the skin. My skin feels soft after putting this on. True to its claim, it does hydrate my dry skin well enough, my cheeks feels plump! 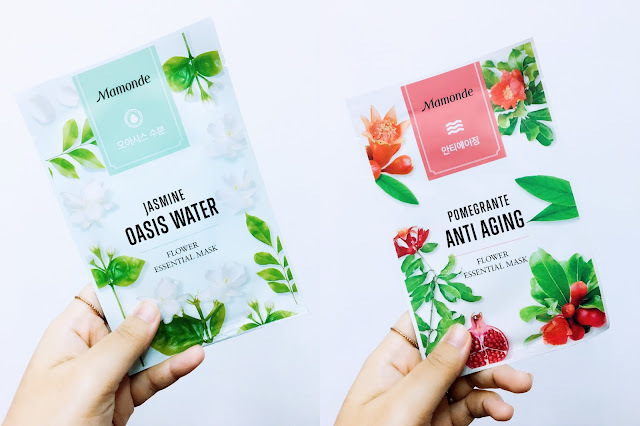 A refreshing moisturizing sheet mask with the lovely jasmine flowers to supply moisture that serves as An oasis for dry skin to quench the thirst. My thoughts: To be honest, I thought I would be hating the scent of this mask because I usually don't like Jasmine scent but to my pleasant surprise it doesn't bother me at all. The scent is pretty okay in this one. This mask contains a clear solution & not that sticky. My skin kept on feeling well hydrated for quite a while after taking the mask off. A double-functional anti-aging sheet mask for wrinkle-correcting and whitening that contains elagic acid from the pomegranate flowers to brighten the dull skin tone and oleanolic acid, also from the pomegranate flowers, to defy aging with the rich nourishment of pomegranate. My thoughts: Smells light and fruity. Slightly sticky. I can feel a little tingle, just a tiny bit when I first started putting it on. It goes away after a minute or two. A nourishing sheet mask with the amino acids and minerals of golden sunflowers and sunflower seeds to nourish rough, tired skin for healthy radiance and glow. My thoughts: I can't really pinpoint what kind of scent this mask have, but I like it. It's light, slightly flowery yet refreshing (does this makes sense?). Anyway, instead of a clear solution, the essence inside is milky and slightly thicker and because of this, it does feel a bit more sticky. A functional whitening sheet mask that brightens dull, dark skin with antioxidants of pure-white magnolia and magnolia barks. My thoughts: This mask also has a milky essence like the Sun Flower. It leaves less stickiness on my face compared to when I used the Sun Flower mask. It's most likely due to my extra dry skin that day; so all the moisturising goodness was soaked in. Also, compared to a lot of whitening masks I've tried before, this mask doesn't leave that usual stinging feeling on my skin either. An exfoliating sheet mask with the witch-hazel extracts to soften the dead skin cells and smooth the skin with moisture and nourishment. My thoughts: I am not sure about the smoothing part as I only use this one time, but I love the feels on my skin after putting this on. The essence is light, watery and clear; also no that sticky to me. A soothing sheet mask with the purifying and soothing capacity of lotus flowers that bloom beautifully in the mud to cool and sooth the fever for hydration and comfort. My thoughts: I reached out to this on the day where my skin looks extra red. It does gives that cooling and soothing feeling, tharee is no tingles whatsoever. The scent is not exactly my favourite- too chemically but I am a little particular about scent so it could be just me. Asked Tammy and Bo to smell it and they said it smells fine. 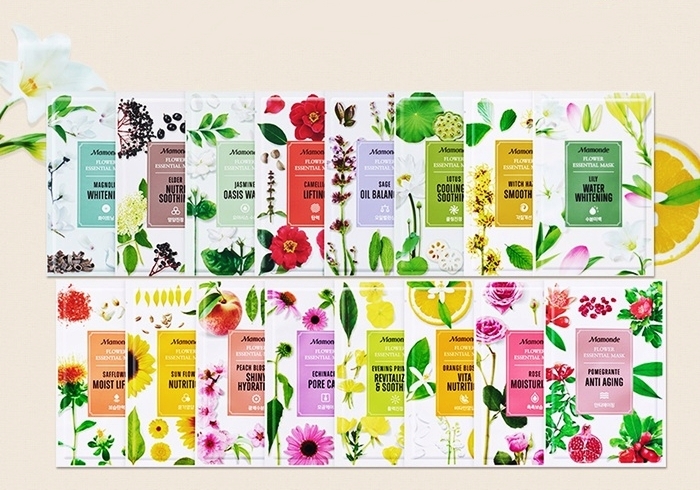 I usually categorise the sheet masks that I've tried into different level which is 'mehh' ⛔ meaning I will never purchase again, 'okay and nice' 👌 meaning that it's nice but doesn't leave a big impression, 'really nice' 👍 meaning that I love them and most likely will be buying again, and lastly 'holy grail' 😍 which means I'm totally in love and can't live without them. For this mask, like the majority of other masks I've tried, it fell in the 'okay and nice' 👌👌👌 category which means I have nothing much against them. The sheet mask texture is pretty nice, with a thick sheet that doesn't tear off easily while I'm putting them on. Overall, their scent is manageable but some are stronger than the other but all of them don't have that too much 'chemical' scent which can be found in some sheet masks. I have a dry skin so I don't prefer using too much chemically based products as they can dry my skin further. Since they are pretty affordable, I think this purchase is worth it. I don't remember the exact price but I think each of them costed me only RM4-RM5 on average. The flowers all look so pretty! <3 I wanna try the Witch Hazel and the Safflower one!